Home in Wattenwyl: Procrastinator's Party. 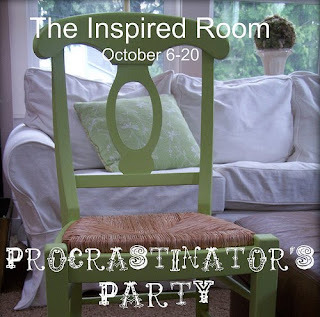 This party invitation from Melissa at the inspired room couldn't have come at a better time. We (mostly me)have been wanting to redo the upstairs bathroom since we have moved in. With the wedding in the summer we have been busy so now is the perfect time to get things done. Can't wait. This picture is my colour inspiration. 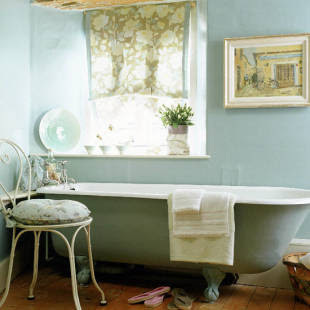 We also have a claw foot tub that I plan on painting the underside of just like this one. 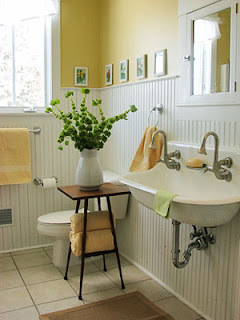 We have an old face mount sink sitting in the barn that we are dying to use in this bathroom. We also plan on doing chair rail trim and doing a two tone paint job. I don't have everything I want to complete this bathroom but I have enough to get it started and over the next few months I will look for all the finishing touches to complete the transformation. Wish me luck! I will post a before picture of the bathroom in mention soon. Stay tuned! I love those colors, too! Best wishes on the bathroom transformation! A claw foot tub! How fabulous! I had one as a child down here in Texas and would give anything to have it back! I look forward to seeing what you do with the bath redo. It sounds wonderful! Love the inspiration pics! Can't wait to see your version. I love your inspiration photos! Can't wait to see what you do in your bathroom! I love clawfoot tubs! We just finished our bathroom makeover with a claw foot tub. I will look forward to what you do and stopping back by. Good luck and stay focused! Ours was a huge undertaking. Oh, I would love to find a claw foot tub for my house. I remember bathing in my grammas as a little girl. They are so nice and deep. Good luck with your bathroom. can't wait to see the after, it will be wonderful!! !